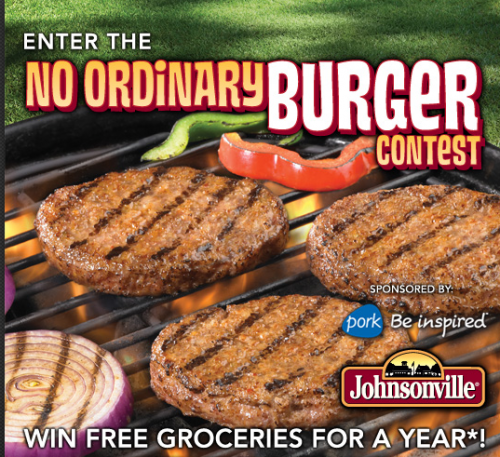 No Ordinary Burger – Win Groceries for a Year! Growing up in Wisconsin, there is one food that is as common place as football and the Packers – brats. Not brat, as in your neighbor’s naughty child, but brat, as in rhymes with lot. Drive through any Wisconsin neighborhood on weekend and the aroma of brats fills the summer evening air. Especially with the 4th of July coming up, there are so many fun grilling memories that surface. Moving to North Carolina, was a complete shift in food culture. Pork here is still loved, but in a pulled Carolina pork form, not our beloved bratwurst form. Every time we would go back to visit family, we’d bring home a cooler full of bratwurst, special Wisconsin cheese and the classic mustard for brats – German-style Dusseldorf (never plain yellow – gasp) because we just couldn’t quite find anything like those from home. Well, that was a decade ago, and now we still love our brats, but we turn to Johnsonville here in NC. After grilling brats (NEVER boiling them), we love loading up garnishes on our traditional brats, so why would it be any different with the Brat Burger? I’m excited to get really creative with some recipes for this, but since my garden is growing and growing, I decided to use what I had, and not buy any additional ingredients. I so enjoyed using my own fresh produce for toppings. Start by grilling your brat burgers, and don’t forget to enjoy the aroma. I was excited when Blissfully Domestic and the National Pork Board asked me to share this amazing recipe contest with you. I knew that my Tasty Tuesday readers, you Foodies, would love Johnsonville’s No Ordinary Burger recipe contest. So take a minute and Enter the No Ordinary Burger contest to win free groceries for a year. You do not have to have a blog or blog post recipe to enter. This is open to any recipe submission. We will definitely be doing a lot of grilling this holiday weekend. What about you? What are you cooking up for the 4th of July? Simple Rules for Tasty Tuesday Parade of Foods – As always, please link directly to your recipe post and not your blog URL, so that everyone can find the recipe months from now. The new image link that I amusing will not accept your recipe without a link back here to beautyandbedlam.com. So excited to link up! Thanks for hosting. Isn’t it interesting how food culture can change over a fairly small distance? And I know what you mean about ketchup – I love it too! I wish we had competitions to win a year’s groceries over here in England, that is a wonderful promotion. And those brat burgers look delish! Thank you for hosting. What timing! I saw those brat burgers in Kroger Friday. I couldn’t believe what I was seeing. I’m glad to hear they taste like the original brats. The only time I’ve eaten brats was when I visited my stepson in Wisconsin. Now, I wouldn’t say they are JUST like the original brats…. 😉 BUT…they were definitely yummy and with the coupons, a great price at Walmart. I’m from the Midwest too – and we love our brats (maybe not to the degree of our Wisconsin neighbors!) 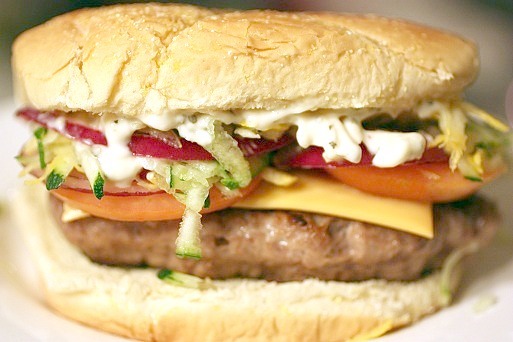 I’ve never tried the brat burger – but it sounds wonderful! Thanks for hosting! I haven’t linked up in awhile-our summer fun gets the best of me sometimes! Anyway, we LOVE brats in our house. We have them almost once a week in the summer. These burgers look delicious and interesting, though. I might have to try them. Thanks for posting about them! What a great contest, groceries for a year! But our Walmart is not the “super” variety, so does that make a difference? I found brat burgers (with a coupon!) at Raley’s recently, and tucked them away in the freezer for future grilling. Guess it’s time to pull them out! I grew up in central Wisconsin, too, and it was a Friday night fish fry for the Catholics, and Brats and onions every weekend for the Germans in the summertime. I’m so glad they’re readily available everywhere now! Thanks for hosting… I do love burgers! this sounds like a WONDERFUL marriage of meats. will have to look for it! I have to remember not to come here when I’m hungry! I love seeing all the summer recipes today since I finally have time to cook. This week, I shared a simple condiment that I make in the summer and freeze for the fall and winter – roasted red peppers.